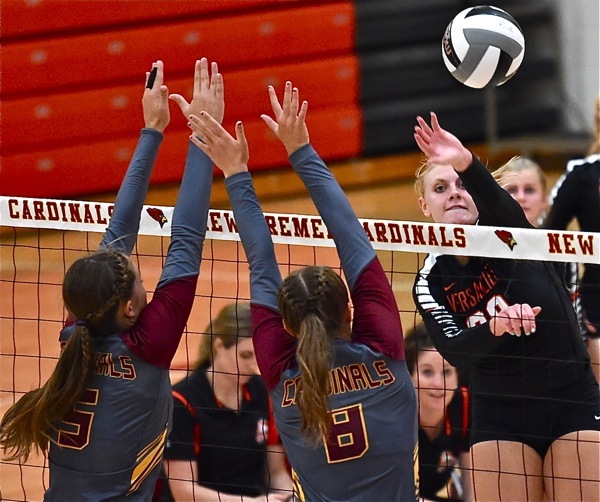 It took ‘new-look’ New Bremen five sets to do it, but they proved again that there’s something about Cardinal volleyball that you just can’t measure. They beat the other MAC state champion Friday, the Versailles Tigers. New Bremen – For as many times as you care to watch them through three weeks, the New Bremen Cardinals proved again Thursday night that they’re not the same team that won the Division IV title a year ago. Different, yet it’s hard to quantify the difference. 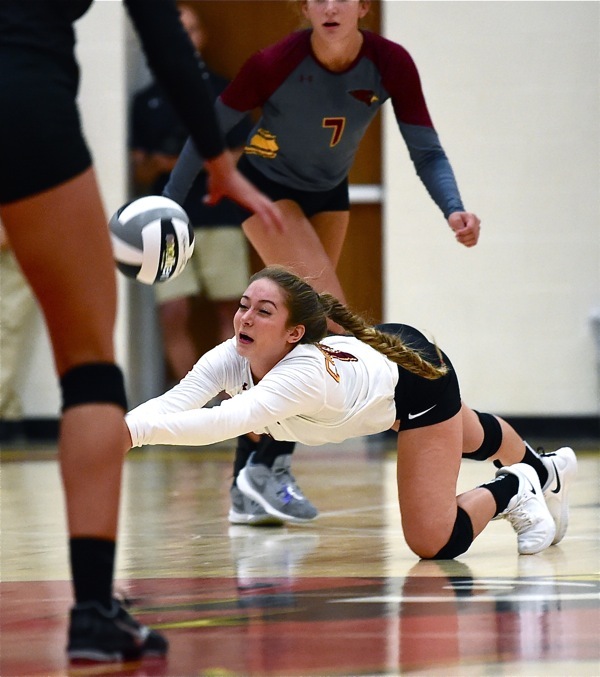 They improved to 7-0 Thursday by beating Versailles 23-25, 25-15, 22-25, 25-15, and 15-7, in another one of those grueling – exhausting, actually – five set matches that Versailles coach Kenzie Bruggeman talked about a week ago. That being, if you let someone hang around long enough bad things are bound to happen. And Thursday Versailles did indeed seem to let Bremen off the hook after an impressive, grinding, first-set 25-23 win. To their credit, Bremen came right back to take the second set 25-15; but Versailles regrouped, played brilliantly at the net on defense, and took the momentum back with a 25-22 win in the third. In spades, in this case. Bremen roared out to a 14-6 lead in the fourth, withstood a short comeback bid by Versailles at 16-10, and evened the match with another 25-15 win to send the match to a concluding fifth game. But strange things began to happen to Versailles – balls that just made it over the net, and two people in the same place at the wrong time, trying to do the right thing. Those kinds of things. Suddenly, it seemed that the universe was spinning in the wrong direction for the Tigers, who dropped the final set, 15-7, to send their record now to 5 wins and 4 losses. 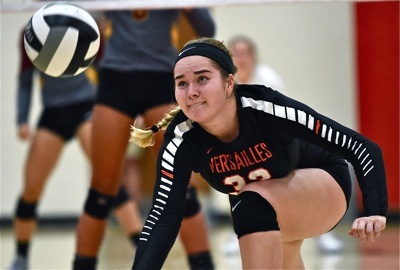 Strange bounces…after taking two of the first three sets the match took a frustrating turn for Versailles. “We made a lot of mistakes in our first set,” said Kramer. “And credit to Versailles because they’re very solid – one of the best teams in our league and they have a chance to get back to state. But we responded to our mistakes. We missed 13 serves in the first four sets, and in the fifth set we don’t miss any, and we had four or five aces. So I’m proud of how we responded, and how we were able to focus on the moment. You can’t go back and change what happened in that first set. It’s a new look for the Cardinals. No flash, perhaps, as they had with Paige Jones a year, but to her point about toughness – this year’s group without question fits of the mold of blue-collar. They take nothing for granted, they work for every point, and they’re patient to let the game come to them. And Thursday…a lot of good things seemed to happen in those last two sets. Exhausting to watch, and no doubt exhausting to play…when the momentum can at one moment seem to close, and with the next point seem to far away. Versailles’ Kelsey Custenborder found herself reaching for a ball too far in the deciding fifth set. You make your breaks in any sport, and the toughest player on the court Thursday turned out to be the smallest…libero Blake Snider. The Cards’ 5’4″ senior played like a woman possessed, from side to side and baseline to net, keeping points of the floor and extended volleys long enough for the points to come. She plays the position as if she was made for it. And in fact, when you’re the smallest player on the court Blake Snider says there really aren’t many options. If you’re quick, and have good anticipation, you’re pretty much predisposed to be a libero. 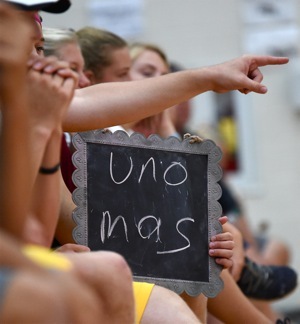 One point to go…the cheering section added a visual reminder for match point. Statistically, they now spread it around. Snider had 9 digs for the match. Macy Puthoff had 8 digs and 8 kills. Abbi Thieman had 20 assists, and Josie Reinhart had 11 kills and 4 aces. Taylor Paul, Rachel Kremer, Claire Pape, and Elli Roetgerman…28 kills between them. And to the point about beating the other state champion in the league….? “It’s exciting,” admitted Snider with a smile. “We look forward to every match,” says Kramer. “But they (Versailles) are kind of in the same boat as we are. What happened last year is in the past, so we’re playing for the moment right now. They’re not the same, perhaps, but still…the champion Cardinals are proving they’re pretty special! New Bremen’s Josie Reinhart (above left) and Macy Puthoff challenge the shot attempt of Versailles’ Liz Ording.